“Content” refers to the structure and organisation of the information, as well as the actual ideas themselves. Also, you should try to put some impact into your introduction. The introduction is the most important part of the presentation because it captures the audience’s attention. A good movie director always tries to put some impact into the introduction and likewise you should try to do this with your presentation. Finally, your presentation should have a central message. This will be a key idea or message that the audience takes away with them from the presentation. If they only remember one thing about your presentation, then it should be the central message. Presentations that don’t have a central message lack focus. Take your favourite hamburger as an analogy. You expect the hamburger to have a piece of bread on top, some meat in the middle and a piece of bread on the bottom. If it came without any bread on the top it wouldn’t be a hamburger. Similarly, if it came without any meat in the middle it wouldn’t be a hamburger. And so the audience the expects your presentations to have three parts. 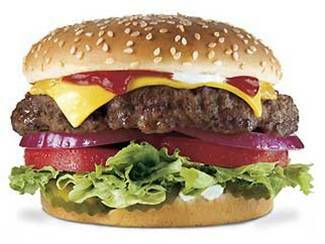 The structure of a presentation is like a hamburger. The introduction is the most important part of your speech. Get some impact into it. (c) Signpost: Tell the audience what you will talk about and why. Content is one of the most critical parts of your presentation. Experience shows that it is better to make your content simple rather than complex. This is because of the “gap” in knowledge between you and your audience. You have been working with the content, perhaps over many weeks and months, and have been designing the presentation, perhaps for many days. This means that you understand the content (the words, ideas, evidence, arguments) intimately. Your audience, however, will only be hearing the content for the first time. Even if it is an area which they have some knowledge about, it will be unlikely that they have intimate knowledge of the subject you are talking about or the particular thesis you are putting forth. 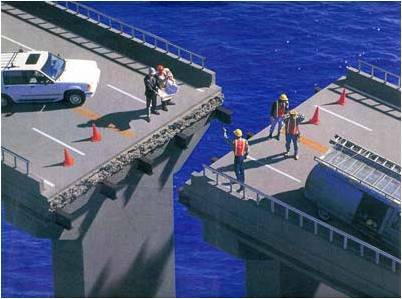 One of the biggest mistakes students make is to assume their audience understands everything they say, and thus they “load up” their presentation with information. This is not effective. A skilled presenter recognizes the “gap” between herself and the audience and tries to “bridge” it by simplifying, making more explicit and by repeating information and summarizing at key stages to ensure the audience is following. The gap situation in a presentation is exacerbated by the fact that a presentation is a one-to-many situation. That is, one person is trying to convey a message to many people. While some in the audience may understand a particular point, other may need it repeating or expanding. Principle of simplicity: Always try to simplify the content. Keep information on visual aids very simple (a few keywords and phrases only) and get rid of redundant phrases and terminology. Principle of repetition and summary: Don’t be afraid to repeat a point if you don’t think the audience has fully grasped it. At key stages in your presentation, summarize what has been said so far. All content has to be relevant to the discourse topic. But this does not mean that you can say anything as long as it is loosely connected to the topic. Relevance is a matter of degree, and the more relevant content appears the better the audience will be able to understand. For example, let’s assume your discourse topic is recycling. Your introduction makes this clear to the audience but then in the first section of the main body you talk about pollution in general (air, sea & land). This move from the specific to the general signals a lack of relevance to the audience. As you can see, the disadvantages far outweigh the advantages. Therefore, it is not recommended that you use a script. You need to practice many times before the presentation to make it smooth. Start practicing well in advance of the presentation. You should practice the introduction at least ten times since this is where the biggest impact will come from. Make sure that you practice as a group a day or two before to make sure the transitions are smooth. Before the presentation, talk with a friend. Don’t stop. Keep talking until your presentation starts. Before the presentation, take deep breaths. Clench your fists. Practice the introduction as much as possible. If you do a good introduction, your nerves will disappear. The more experience you get of making presentations, the less nervous you will become. Think positive. if you believe that you can make a good presentation, then you will make a good presentation. In one-to-one communication, there is frequent eye contact and backchannels (um, er, yeh, mhm). In one-to-many communication, eye contact and backchannels are less frequent – it is just the nature of the communication situation. 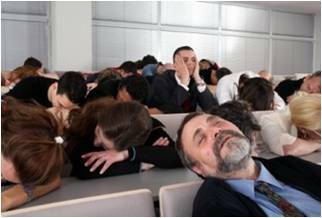 So when you get up to do a presentation and the audience appears to be sitting like a group of disinterested robots, keep going – keep smiling, talking, keep trying to engage them. Inside they are listening and hopefully you will bring a smile to their face at the end.